Datalogic’s Memor 10 is a reliable PDA, which comes in a handy smartphone design but is enterprise-ready and extremely rugged. The mobile device is equipped with latest WiFi technology and LTE for advanced communication abilities. Bluetooth, NFC and a 13-megapixel camera are also integrated. The PDA is suitable for indoor and outdoor applications like access control, inventory management or other applications in retail. 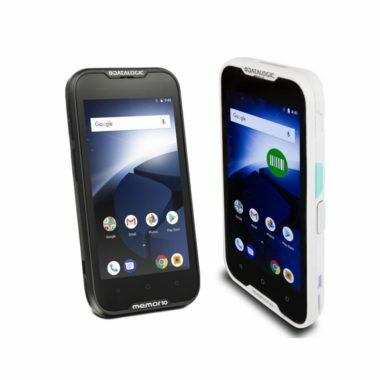 Datalogic’s Memor 10 is a rugged and reliable handheld computer with a compact and handy form factor. The user-replaceable battery can be charged wirelessly. It comes with the latest WiFi technology and with LTE for advanced communication abilities. Bluetooth and NFC are also integrated and ensure a user-friendly operation. The Memor 10 from Datalogic is a reliable PDA which is suitable for a variety of applications indoors and outdoors, for example in retail, transport and logistics or manufacturing. A healthcare version with a disinfectant-ready housing is also available. Typical applications are access control, inventory management or other retail applications. With a clear 5” display, which is equipped with Dragontrail hardened glass, the Memor 10 handheld it is particularly robust. It is sealed in accordance with protection class IP65 and withstands several tumbles and drops onto concrete. Other features are Android 8.1 with GMS and a 13-megapixel camera. The integrated 2D Imager allows 1D/2D barcode capture and reads postal and stacked codes as well. The Memor 10 PDA features Datalogic’s patented ‘Green Spot’ technology for clear good-read feedback.